It is always a pleasure to teach children, especially smaller children who are always full of the joy of life, innocence and naughtiness. Spring Into Reading, a learning centre for children in KK Nagar, encourages children to demonstrate oral comprehension by predicting story events, asking and answering questions about texts they’ve listened to, retelling stories, and relating story events and their own experiences. Children are encouraged to read books, and engage in buddy reading, individual silent reading, and guided, small-group reading sessions with the teacher. One of the main activities is Kathaanaka, story-telling sessions that help make small children enthusiastic readers later on. In an effort to reach out to parents and teachers in all of Chennai, Spring Into Reading will conduct Kathaanaka, a storytelling session with Jeeva Raghunath for the public – parents, teachers and children – on Friday, August 8, from 7pm to 8.30pm, at the German Hall on Habibullah Road in T. Nagar. Tickets will be priced at Rs 75 and will be available at Landmark and Peek-a-Boo Patterns (24992365). For more details and block booking, you can contact Spring into Reading (9940450495 or 9940286740). 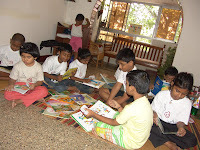 Picture shows children engrossed in books at the centre.